Bicycling is so highly regarded in Boulder that sometimes the city plows the Boulder Creek bike path before they plow the streets! The exterior of the house located in Boulder was used as the characters&apos; home in the well-known "Mork & Mindy" television show. It is now a private residence. Parts of the movie "Sleeper," with Woody Allen, were filmed at the National Center for Atmospheric Research. Baseline Road is a significant east-west route to both Boulderites and cartographers, for it marks the 40th parallel on world maps. Boulder&apos;s Third Flatiron towers 1,400 feet high, a few hundred feet higher than the Empire State Building, and has been climbed by people without using their hands, on roller skates, naked and in eight minutes (by separate climbers). A survey by the Centers for Disease Control found that Colorado had fewer overweight people per capita and more people who exercise than any other state. 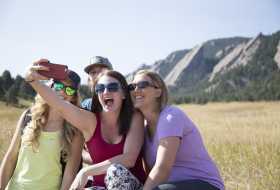 Boulder was called the Happiest City in the U.S. by National Geographic and has a repeated rating as the nation&apos;s best city for well-being by a Gallup study. A Colorado Daily poll found that seven out of 10 Boulderites own bicycles. Another guidebook states that Boulder&apos;s bicycle count is approximately 93,000 — almost equal to the total population! 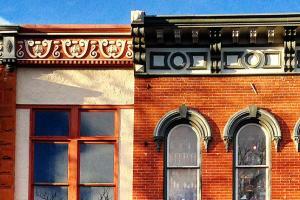 The Chautauqua Auditorium is an all-wood structure built in 1898. In the evening, when the Colorado Music Festival musicians stop playing, you can often hear the rafters-dwelling owls hooting along with the music. 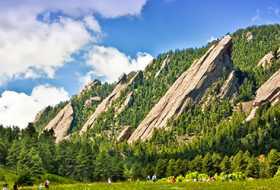 The Flatirons Mountains got their name by pioneer women who said they looked like flat, metal irons used to iron their clothes. Flagstaff Mountain was named for the flagpole that sits on top of the summit, which was visible when Boulder was first settled, as it was a completely treeless plain. Scott Carpenter, a NASA astronaut, grew up in Boulder. There is a city park named after him, with a playground featuring a rocket-shaped climbing structure. The University of Colorado at Boulder&apos;s buildings are built with red sandstone, quarried in nearby Lyons. With Coors and Anheuser-Busch nearby, plus 20 local microbreweries, this area has become the largest beer-producing triangle in the world. Robert Redford was a janitor at The Sink, before moving on to become famous! 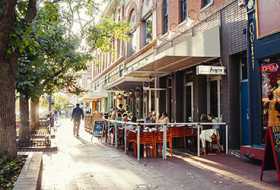 Boulder has more used bookstores per capita than any other city in the country. Boulder&apos;s going to the dogs! Visitor counts to Boulder Mountain Parks found a ratio of 1 dog to every 5 visitors. 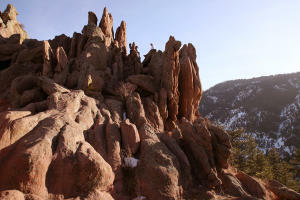 Every year, Boulder Mountain Parks core area receives 1.8 million visits. If that many people made a human chain, it would stretch from Boulder, Colorado, to New York City! 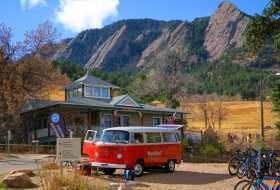 In the past, Chautauqua Meadow has served as a cattle pasture, golf course, backdrop for the "Mork & Mindy" television show and a ski area with rope tow, all before it was protected as a natural grassland. 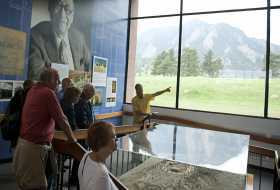 In 1967, Boulder became the first city in the United States to tax itself for funds to be used specifically for the acquisition, management and maintenance of open space. 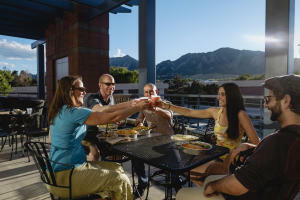 The Hotel Boulderado was named by combining Boulder and Colorado so no visitor would ever forget where they had stayed.